Regression analysis is an invaluable statistical methodology in business settings and is vital to model the relationship between a response variable and one or more predictor variables, as well as the prediction of a response value given values of the predictors. In view of the inherent uncertainty of business processes, such as the volatility of consumer spending and the presence of market uncertainty, business professionals use regression analysis to make informed decisions. Applied Regression Modeling: A Business Approach offers a practical, workable introduction to regression analysis for upper-level undergraduate business students, MBA students, and business managers, including auditors, financial analysts, retailers, economists, production managers, and professionals in manufacturing firms. The book's overall approach is strongly based on an abundant use of illustrations and graphics and uses major statistical software packages, including SPSS(r), Minitab(r), SAS(r), and R/S-PLUS(r). Detailed instructions for use of these packages, as well as for Microsoft Office Excel(r), are provided, although Excel does not have a built-in capability to carry out all the techniques discussed. * A companion Web site with all the datasets used in the book, classroom presentation slides for instructors, additional problems and ideas for organizing class time around the material in the book, and supplementary instructions for popular statistical software packages. An Instructor's Solutions Manual is also available. 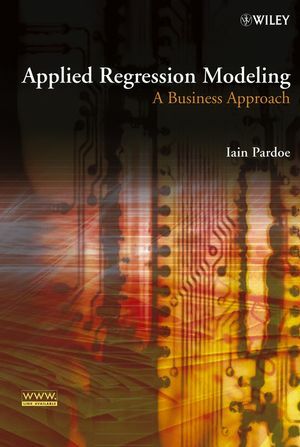 Applied Regression Modeling: A Business Approach fully prepares professionals and students to apply statistical methods in their decision-making, using primarily regression analysis and modeling. To help readers understand, analyze, and interpret business data and make informed decisions in uncertain settings, many of the examples and problems use real-life data with a business focus, such as production costs, sales figures, stock prices, economic indicators, and salaries. A calculus background is not required to understand and apply the methods in the book. IAIN PARDOE, PHD, is Assistant Professor in the Department of Decision Sciences in the Charles H. Lundquist College of Business at the University of Oregon. His areas of interest include Bayesian analysis, multilevel modeling, graphical methods, diagnostics and validation, choice modeling, and statistics education. He has published research in many leading statistical journals and has received multiple university-wide and association-related awards and honors. 4. Regression model building I. 5. Regression model building II. Appendix A: Computer software help. Appendix B: Critical Values for t-distributions. Appendix C: Notation and formulas. Appendix E: Brief answers to selected problems. A generous selection of exercises is included in each chapter with their fully worked-out solutions. An optional chapter on extensions to advanced models is included for the benefit of those readers who invite challenge. The text includes some topics (exs. model understanding, diagnostics, Bayesian inference) that have heretofore never been mentioned in books of this type. A chapter containing case studies shows the direct applicability of the material. A refresher chapter on basic probability and statistics is presented for those readers who need to get up to speed at the outset. After presenting all the necessary linear regression material, multiple regression techniques are naturally introduced and expanded upon with the additional use of illustrative graphs. 100 figures to aid in understanding the material. List of references, glossary, and comprehensive topic index. Companion website includes datasets, presentation slides for instructors, a solutions manual containing complete answers to all the homework problems, additional problems that could be used in conjunction with the book, and further ideas for organizing class-time around the material in the book.